There is something nasty in the woods, as a killer has been burying bodies in sites marked with his own sinister symbol. For detective Louise Henderson this appears as more than just another murder case, as The Bone Keeper is a legend that haunted her childhood and has now become a grisly reality. Uncovering the identity of this killer will mean looking deep into parts of her own past that she has kept locked away for years. 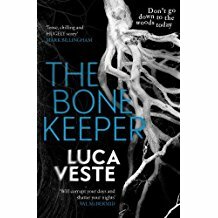 Mixing crime fiction with a touch of the supernatural is not an easy trick to achieve, but Luca Veste manages to do so with no small amount of style. Along the way he shows a subtle understanding of the way urban myths activate our primal fears - by bypassing adult rationality. All this is contained within a deftly constructed serial killer narrative that touches all the bases appreciated by readers of the genre, without reducing them to tired clichés. Veste has a sharp eye for the darker aspects of contemporary British life, from our fascination with violent crime to the compulsion to share everything and anything on social media. His prose style is faultless and Henderson makes for a compellingly troubled main character, complete with a secret that is both shocking and integral to the plot and the dilemma she faces. This is an enjoyable if often unsettling standalone novel that adds to Veste’s already considerable reputation as one of the younger writers of dark contemporary crime fiction.